Dimensions 1 by 7 by 8.75 in. 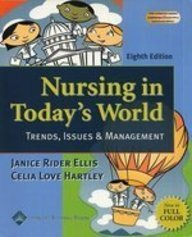 This vibrant full-color issues and trends text presents basic concepts underlying professional nursing along with contemporary issues affecting the profession, including educational preparation, health care finance, legal responsibilities, and ethics/bioethics. Critical Thinking exercises are embedded throughout the chapters. Key terms and concepts are highlighted in bold. The Eighth Edition features focus questions, more leadership and management content, web resources, and updated cartoon images. Instructorâs resources include a CD-ROM with an instructorâs manual, test generator and the âConnectionâ Website, connection.LWW.com/go/ellis.